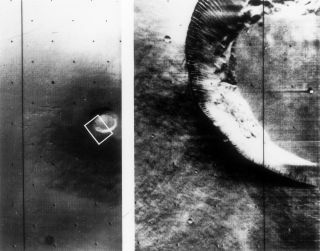 Mariner 9, the first spacecraft to orbit another planet, arrived at Mars on Nov. 14, 1971, and returned remarkable images of the surface. This shield volcano on the Red Planet's surface reveals a summit crater and grooves believed to be from subsurface magma flows. Follow us @Spacedotcom, Facebook and Google+. Original story posted on Space.com.